Today I had the opportunity to see Frederick Douglass' personal photograph album, part of the collection of Howard University's prints and photographs holdings at the Moorland Spingarn Research Center. The album holds four images per page (front and back) and contains a number of cartes de visite, including a portrait of Douglass' son Sgt. 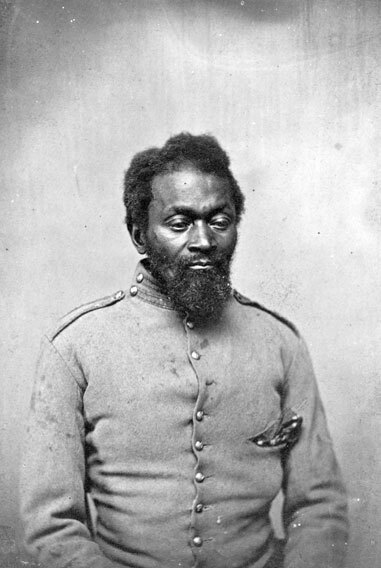 Maj. Lewis H. Douglass, who served in the 54th Massachusetts Volunteer Infantry. His image and story will be included in my book. The album binding is loose, and a number of pages are empty. Nevertheless, it belonged to Frederick Douglass, and I felt privileged to see it up close, thanks to Joellen El Bashir, Curator of Manuscripts. She was extremely helpful and made my visit a success. I started to research the life and military service of Pvt. Benjamin Benson, Company C, Twentieth U.S. Colored Infantry. Benson was born a free man in Bergen County, New Jersey, where he resided all his life — with the exception of his two years in the army. Benson's New Jersey connection was a pleasant surprise, for we both were born in the Garden State. I look forward to learning more about Benson and the Twentieth, a regiment formed in early 1864 and deployed to Louisiana, Texas and Tennessee. Benson's portrait photograph is one of two identified African American cartes de visite shared by Don Wisoski, author of The Opportunity Is At Hand: Oneida County, New York, Colored Soldiers in the Civil War. I've enjoyed getting to know Don. His cheery, upbeat attitude and passion for Civil War photography has made for several enjoyable conversations, and a new friendship. That Nick Biddle went to war with a company of Pennsylvanians from Pottsville is beyond doubt, as evidenced by the carte de visite photo that shows him wearing the uniform jacket of the Washington Artillerists, which later formed the nucleus of Company B of the Keystone State's Forty-eighth Infantry. Moreover, that he suffered a serious head wound during the Baltimore Riots of April 1861 is an event for which he was recognized at the time as the first man wounded in the Civil War. His military record is one that commands attention and respect for his sacrifice. Only Biddle never served in the army officially. Men of color were not allowed to enlist. That would come later. Instead, Biddle served as an orderly to Capt. James Wren, who went on to become major of the Forty-eighth. By the time African Americans were allowed to join, sixty-five-year-old Biddle was finished with army life. His story is unlike any other individual I've researched for my column and books, as all were formally enlisted soldiers. And yet his short-lived experience helps frame the larger issue of race for which our ancestors struggled to deal with in four bloody years of war, and his personal story the sacrifice and dedication of an American to his country.